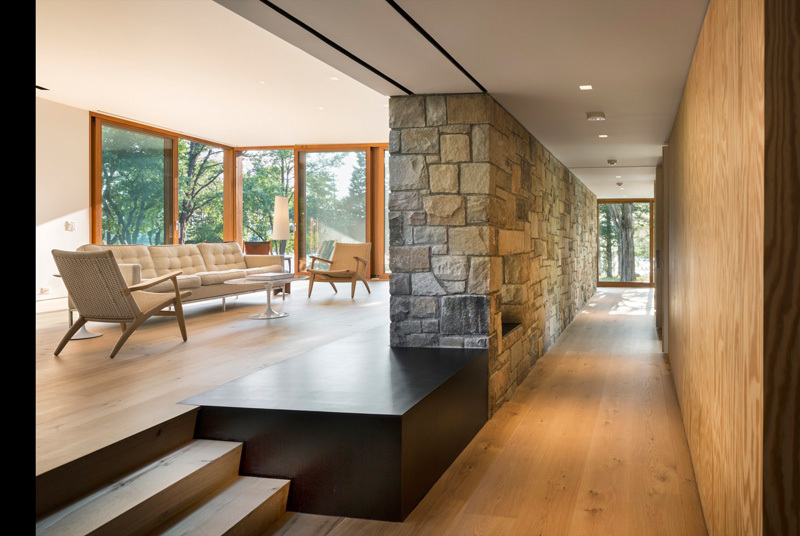 A contemporary house has a stone granite wall all throughout the interior and has stones in the exterior. There are some homes that are designed years ago but when updated, its look become better than the previous home because new features are being added and most of them are modern in style or would fit the modern lifestyle of the owners. We have seen many home design updates already and how the new home looks totally mind blowing than the previous houses. But of course, there are certain features that are retained to give it traces of the original structure. This is what we can see in the house that we will feature today. 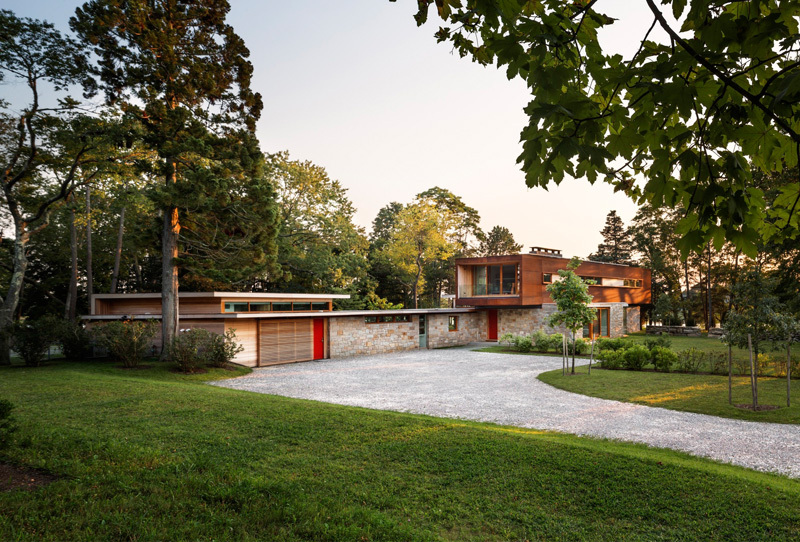 Architect John Lincoln, a former senior architect for the Navy at Quonset Point, a professor of architecture at the Rhode Island School of Design, and the inventor of the Quonset Hut, designed a home in Stonington, Connecticut back during World War II (1945). With the sound of it, the home is really something from the past and needs some update in order to fit the needs and lifestyle of a modern family. 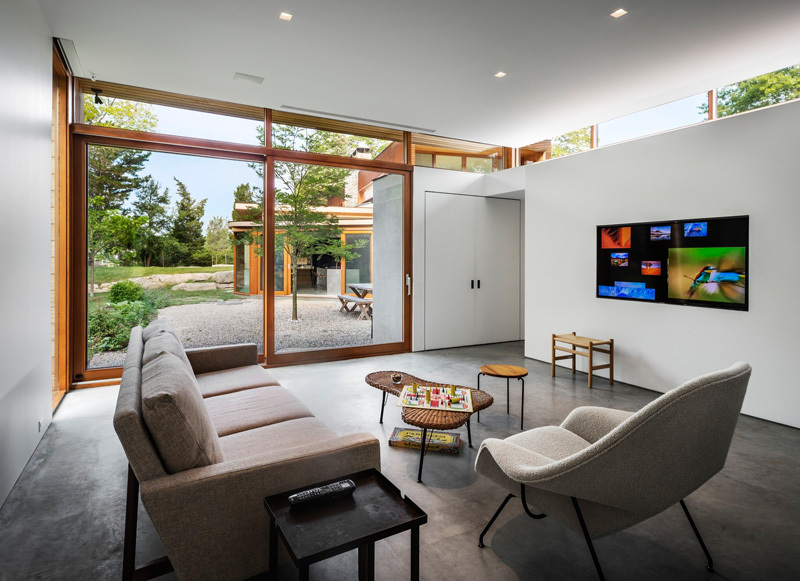 With that, architecture firm Joeb Moore & Partners worked on the home to give it a transformation that will fit the requirements of the owners. 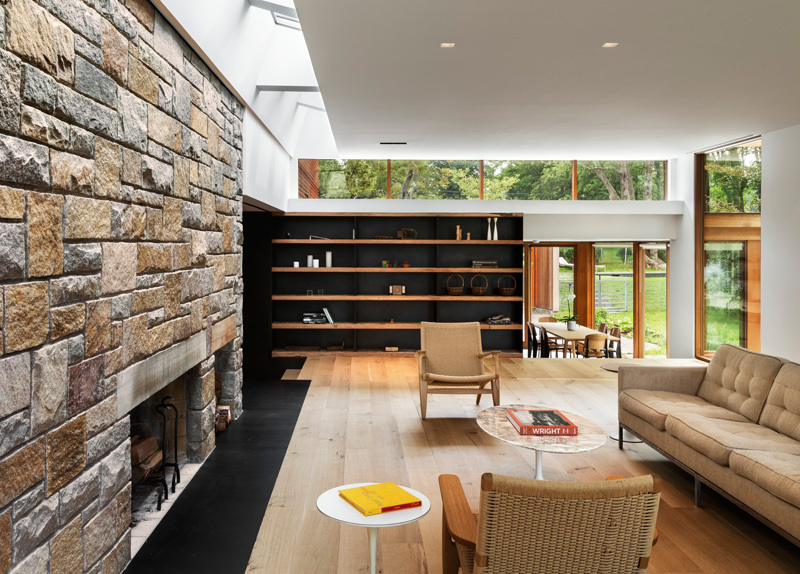 The house retained the large stone wall that runs into the interior of the home. Such feature has given the house a unique character and personality. Let us take a look at the house below. Unique feature: A contemporary home with a well-designed exterior and an inviting interior featuring a stone granite wall that was retained from the original house design. 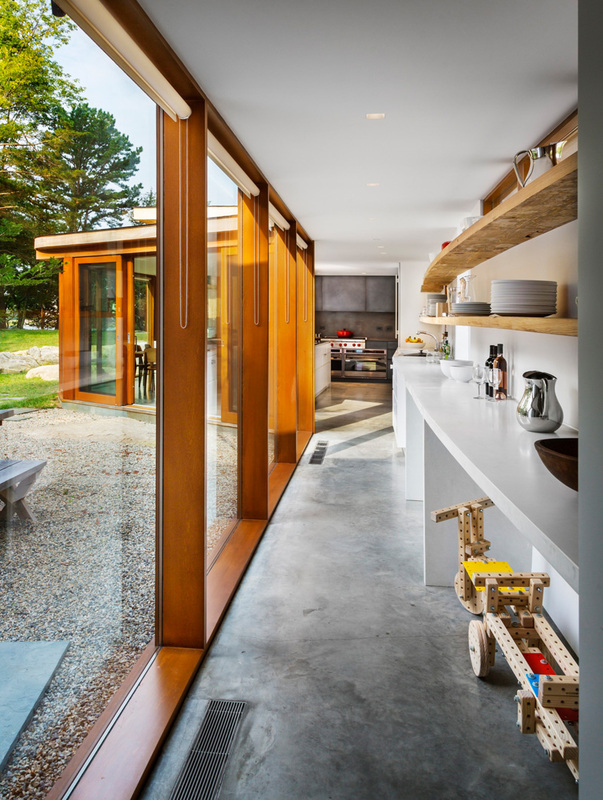 You can see here the architecture of the house that widely used glass and wood together. What adds to its appeal are the lighting as well as the trees in the outdoor area. 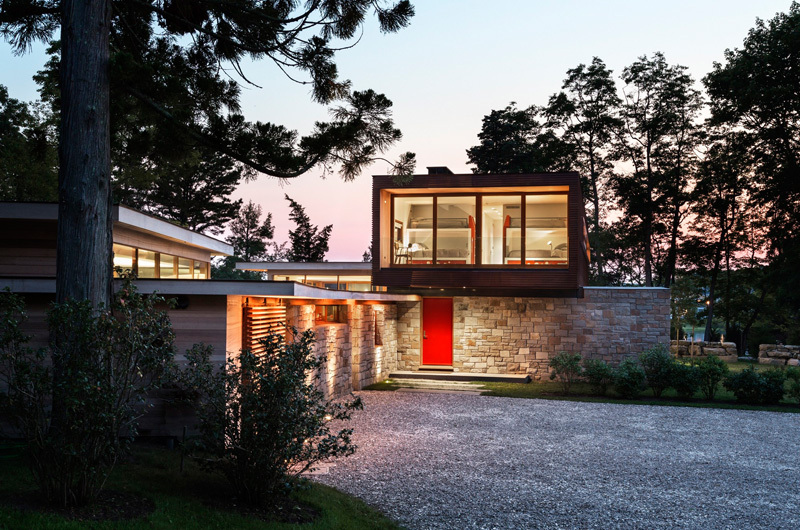 You can also see a mix of materials in the exterior that includes stones. What add to the beauty of the yard are the large rocks that are surrounded by the green lawn. You can see another angle of the house where the red doors are being emphasized since the walls have stones around it. A wooden volume is seen on top of the lower area. You can also see the pathway towards the garage. I honestly didn’t expect that there will be red doors in this house but these surely added appeal to the homes exterior. There are also wooden louvers on some windows of the house too. 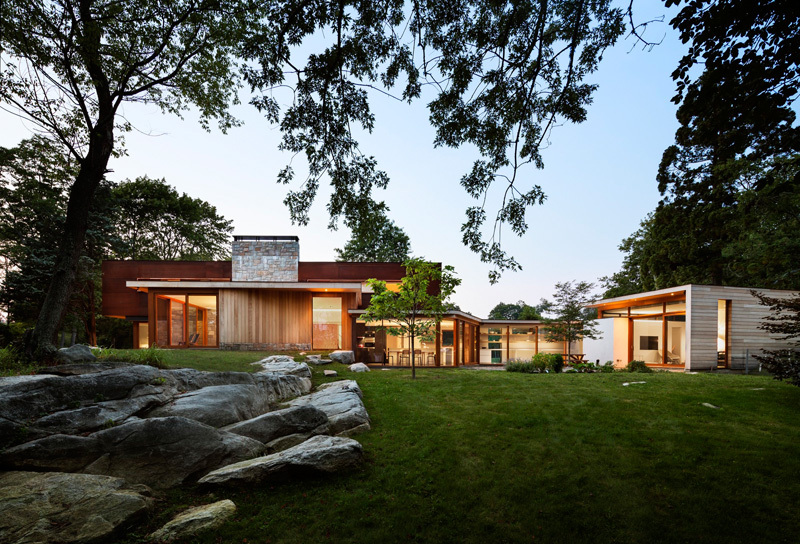 But what really bring out the beauty of this Stonington house are the trees all around it. The house is situated on a small stone ledge which is between 300 feet of waterfront and a large meadow. After getting a contemporary update, the house looks really amazing just like what we can see here. Some parts of the house are transparent with glass. And of course, another tree is seen here. What we can see here is a blackened steel wall with wooden shelves that has been inspired by the industrial heritage of the Quonset. It is a nice spot to store home items and to put some display. All throughout the house, there is an original stone granite wall that runs in it. This feature doesn’t just bring in a touch of nature but it also adds beauty and texture to the area. The house also has an elevated living area with comfy contemporary furniture. Like what we have seen in the previous photo, the living area of the home has been raised from the surrounding kitchen and dining room. Its fireplace is covered with stone granite all and it has wooden flooring. You can even see the dining area from here. Now this is the dining room and kitchen that share the same space. It has gray and white colors in here and is filled with natural light. The look is almost midcentury in style because of the design of the dining chairs being used here. The kitchen island has white cabinets under it. 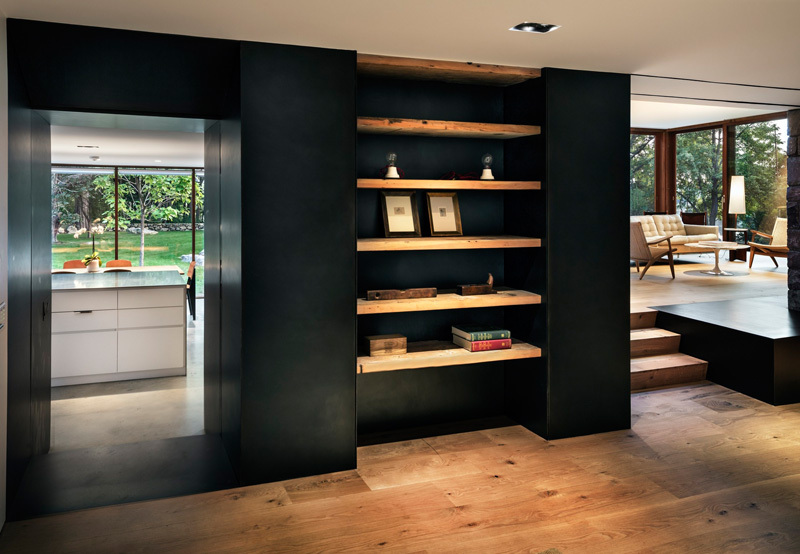 A walkway in the home was utilized by adding a large shelving unit that lines it. Tall glass windows are also used here which are framed with wood. Even from this area, the beauty of the outdoor space can be seen. The beauty of the surrounding area of this Stonington house can be seen from the family room as well as from other parts of the interior. The family room has an eclectic mix of furniture and has white walls around it. Now this is the bathroom of the house. Its wall is covered with stone which is the same stone granite wall we saw in the living room. 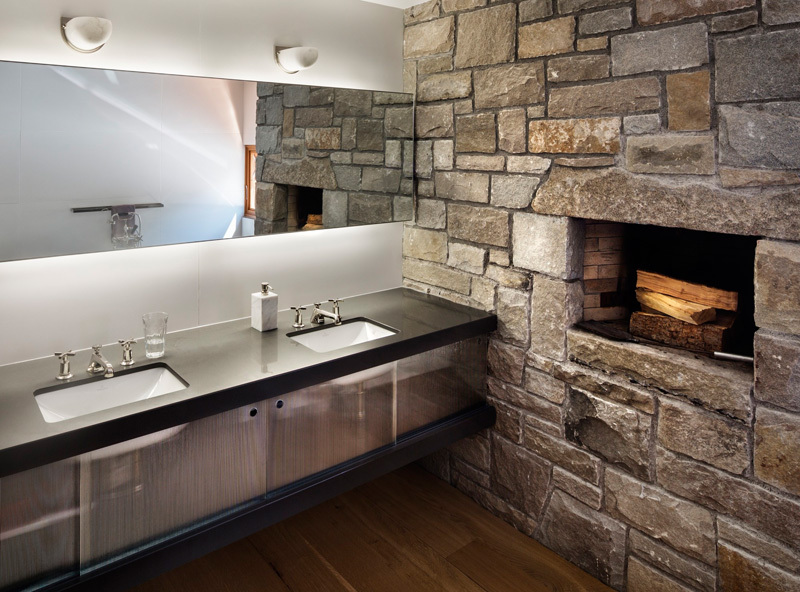 Even the bathroom has a fireplace too. Notice the design of the vanity. Isn’t it very nice and sophisticated? I don’t know about you but for me, I really like anything with stones, wood and other natural element. I look at it as a stunning feature because aside from achieving a modern or contemporary look, it can also bring in nature to the home. 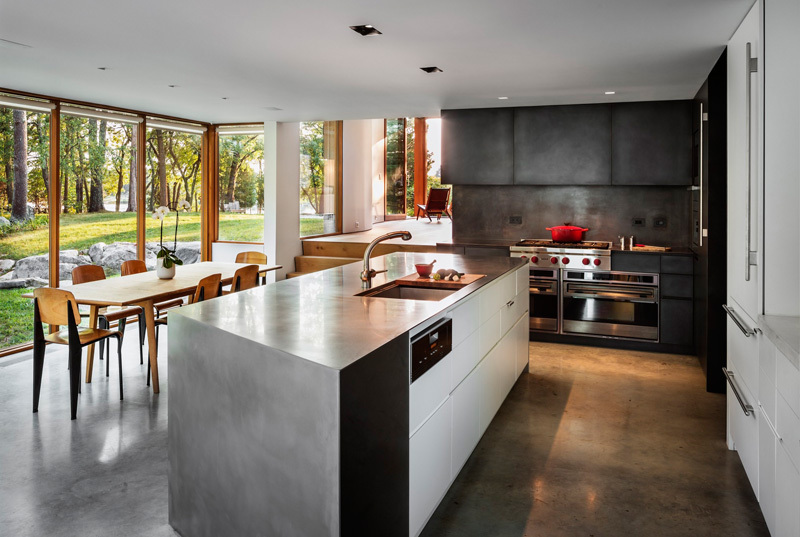 This house is designed by Joeb Moore & Partners who did an amazing job to the redesign. 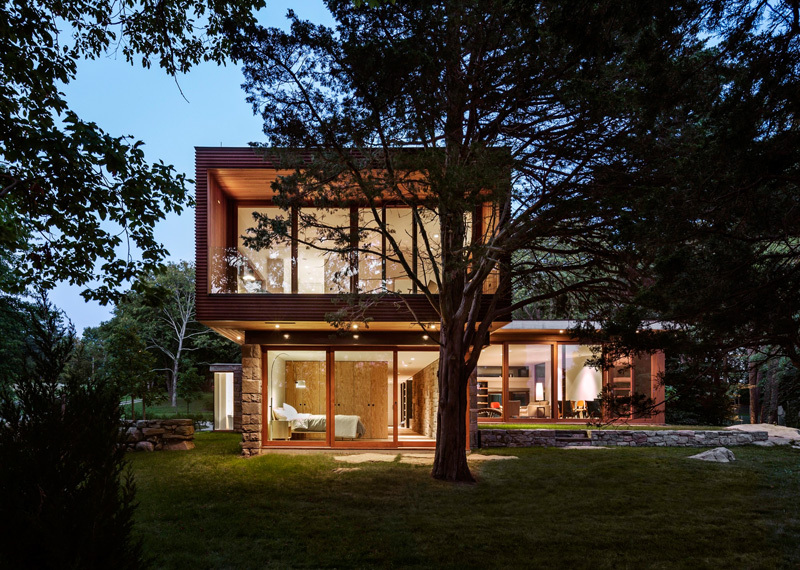 You can notice that it used tall glass windows to allow natural light into the structure. Aside from that, there are minimal furniture and decors added into it as we can see in the images above. I also like the exterior design as well especially that wood was being emphasized. All in all, this is a home most of us would surely love!